LivePlan gives you powerful forecasting & reporting tools for delivering advisory services. 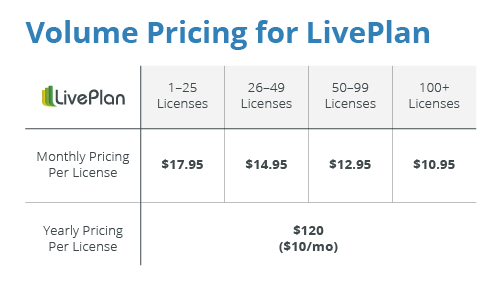 The LivePlan Method teaches you the best way to offer those services to your clients. Learn how LivePlan can revolutionize your practice. Are you tired of doing low-value, compliance-based work? Finally, new training showing you how to deliver and profit from high value business advisory services! 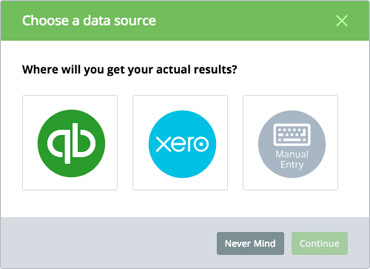 Seamlessly bring your clients' QuickBooks Online or Xero data into LivePlan and see how their business is doing from any computer with internet access. Never export financial data to Excel again. 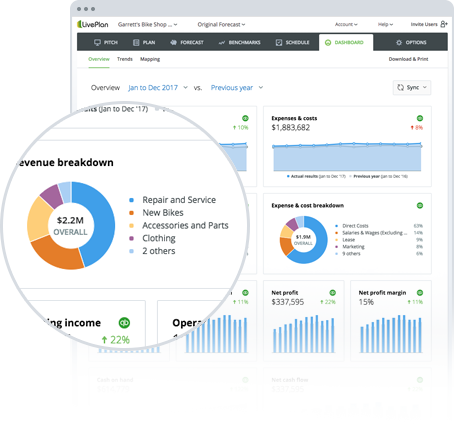 LivePlan's Dashboard displays up to three years of financial data instantly, in charts and graphs that make sense to small business clients. Compare timeframes and view trends. Combine your expertise with our easy to use charts, and deliver your advisory services efficiently. 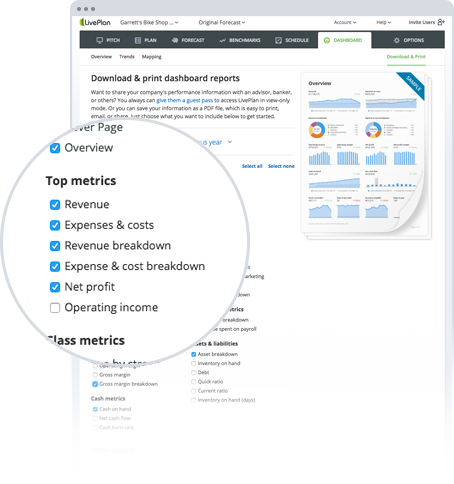 Select the reports and metrics you want, and create a beautiful reporting package within minutes—even add your company logo. LivePlan makes it easy. 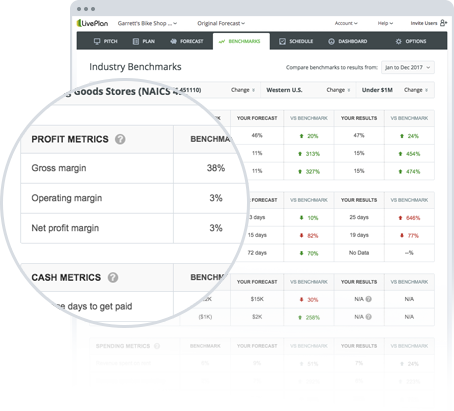 Industry benchmarks show clients how they compare to their competition. LivePlan displays Benchmarks alongside the forecast and the actual data for deeper insights. Select industry type, region, and size to customize the data for each client. 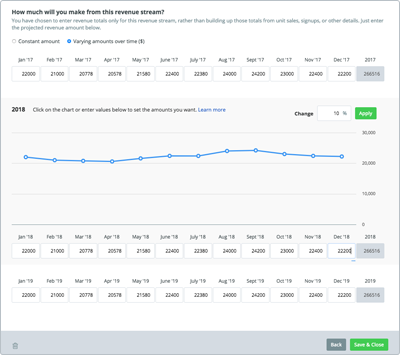 Powerful yet simple tools to allow you to plan, model, and monitor cash flow and make spending decisions. Set cash drivers dynamically, and model cash scenarios. LivePlan helps you build a strategic financial forecast quickly and smartly. Start with an automated forecast based on your client's accounting data and modify from there, using our wizards and templates to guide you. 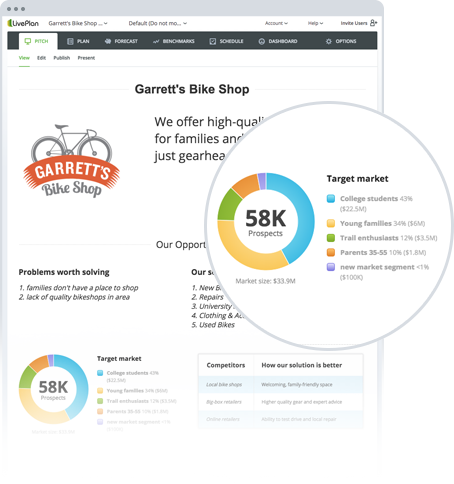 LivePlan allows you to build a full lender-ready business plan or use the powerful Pitch feature to quickly and easily build a one-page business overview. Step-by-step guidance, online training, and over 500 business plan examples will help you guide your clients and think strategically about their business. LivePlan is the proud winner of the 2016 Accountex User Favorite Award for Business Intelligence. Presented in partnership with AccountingWEB, the Accountex User Favorite Awards are the most sought-after awards in the field of accounting technology today. Winners were selected from a competitive landscape by the people who use these solutions daily. 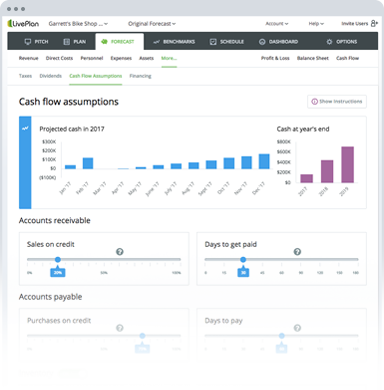 LivePlan is a fantastic budgeting and forecasting tool and the Dashboard feature easily connects with accounting systems to help accountants stay in touch with their small business clients year-round. With the help of LivePlan, accountants can position themselves as trusted advisors for small businesses. Recipients of this award must demonstrate that they are changing the accounting profession by responding to the evolving needs of the tax and accounting professionals by providing technology that addresses the new reality of on-demand information and business agility—and LivePlan fits the bill.